It is named after the renowned Buddhist Monk Nagarjuna (the famous Buddhist scholar and the contriver of Mahayana Buddhism) who imparted his summons over here. Now what looks like an island was once an important settlement during the 1st and 2nd Century BC. It is an important Buddhist learning centre, flora and fauna rich location and an archaeological paradise as well. The place is flaunted with Stone Age tools, Buddhist Stupa, Statues, Pillars, Monasteries, Waterfalls, Forest, Museum; it is a paradise for tourist where one could even enjoy head scorching over head noon sun. Located in Guntur District of Andhra Pradesh, Nagarjuna is one of the tourist flooded region of the South India. Nagarjunakonda is formed by two words Nagarjuna the famous Buddhist Monk and Konda meaning Hills in Kannad. It is known as one of the richest Buddhist Learning Centre and has many caves that exhibit Buddhist carvings. Nagarjunakonda was the capital of Ikshvaku Kingdom and was called Vijayapuri. It is the third most important cultural centre of South India, and is surrounded by world's third largest man-made Lake Nagarjunasagar Lake. A six year long major excavation had to be taken place in order to save the relics from being flooded by the formation of NagarjunaSagar. The excavation resulted in detection many Buddhist ruins, stupas, temples, pillared pavilions, white marble statue of Buddha, coins, jewelry and many more ruins. 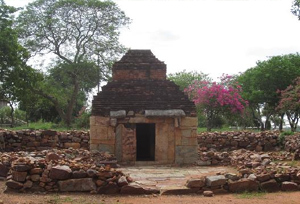 A. R. Saraswati was the first Archaeologist to have discovered the ruins of Nagarjunakonda in the year 1926. During the excavation Paleolithic and Neolithic Era's Stone Age tools were discovered. There are still many findings that occur till date. 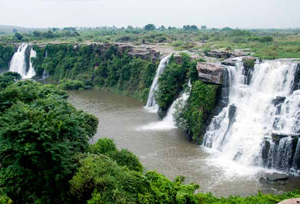 Ethipothala Waterfalls: Ethipothala Waterfalls are formed by the cascading of the Chandravanka River a tributary of Krishna River from a height of approx 70 ft into a blue lagoon an active crocodile breeding centre. The waterfalls exhibit the force and beauty of Nature in a single moment all together. It is an eminent picnic spot flooded by tourists. And one must not give a miss to it on a trip to Nagarjunakonda. Nagarjunakonda Museum: The Nagarjunakonda Museum is one of the main tourist attractions in Nagarjunakonda. It houses the entire Buddhist, Paleolithic and Neolithic artifacts, ruins and relics that were found in the archeological finding. The most unique part of the museum is that it displays the finding done by Buddha himself, which includes some Stone Age tools. Nagarjunakonda Caves: These are the places to visit in Nagarjunakonda, discovered in 1950's these caves encapsulate many ancient Chaityas, Viharas, Monasteries and Stupas. Many Buddha Statues were found here. Nagarjunasagar Dam: Nagarjunasagar Dam apart from being the tallest masonry is the pride of the Nation. The spectacular view of the dam exerts the pull on the travelers from wide and far. By Air: The nearest airport is in Vijayawada situated at a distance of 65 km. By Rail: Macherla is the nearest Train Station at distance of 20 km from Nagarjunakonda. By Road: It is well connected to Hyderabad (150 km), Guntur (37 km), Vijayawada (80 km) approx.